A talk by Mrs. Penny Weeks. 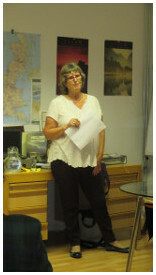 In her talk ‘The Diplomatic Bag’, Penny Weeks gave us a fascinating insight intoher life as a diplomat’s wife. First meeting her husband as a nanny in Libya, Penny travelled the world with him. The duties of a diplomat’s wife were to entertain and socialise, to support charities and attend functions. In their various postings Penny and her husband experienced exciting times: from a bugged apartment in Bulgaria to the experience of war in Beirut and the fall of the wall dividing Berlin. Penny lived through a tense time after war broke out in the Lebanon and she had to leave her husband behind, with weeks of uncertainty as to his well-being. In East Berlin the Weeks experienced the huge euphoria as the wall fell. There were many positive experiences but there was also a downside. Leaving good friends behind was hard and entertaining and socialising was not always easy. Perhaps the most painful experience of all was parting with children as they were sent off to boarding school. One friend who remained was Hazel Zeiner, met on a short posting to Innsbruck. With Hazel and her family Penny experienced a diplomatically dicey situation in East Berlin, when the Zeiner and Weeks children climbed over the wall without having the appropriate visas stamped! Among other postings were stays in India and Ecuador. After all their fascinating travels and the good years they had experienced Penny and her husband were happy to settle down in England again. We thank her for a most interesting talk.